Rapper 50 Cent made a cool $100 million from his ownership stake in Vitamin Water. Will his investment in 3D glasses-maker Gunnar Optiks prove just as lucrative? Curtis “50 Cent” Jackson gets money–and not just as a hip-hop megastar. The Jamaica, Queens-born rapper has been filling his piggy bank with a slew of non-music side-projects. He founded and runs a big-time record label under Interscope. He’s launched successful sneaker and clothing lines. He’s starred in hit movies and video games. And most impressively, he invested a pretty penny in Vitamin Water-maker Glacéau, which sold to Coca-Cola in 2007 for $4.1 billion, a deal that earned 50 an estimated $100 million. For many, staring at LCD screens and digital projections can cause headaches, diminished focus, and tired or dry eyes. Gunnar Optiks creates lenses optimized for a sharper digital viewing experience that extinguish the “polarizing light” and “ghosting” effect that can often plague the eye. The company develops these lenses for a range of fashionable, high-end indoor, outdoor, and 3D shades, which retail between around $70 to $200–a price tag that likely attracted 50 Cent. Though sources wouldn’t reveal the percentage stake 50 Cent has, it appears that he’s following his investment in Glacéau as a model. 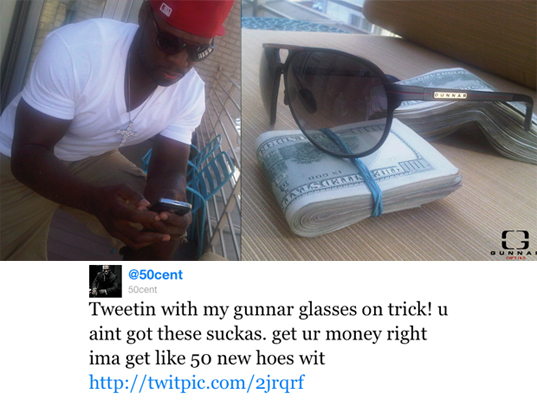 With Vitamin Water, 50 acted as both an investor and endorser, taking advantage of his worldwide renown to push the products on the street (and on his Twitter, pictured above). As Michelsen explains, he’s helping facilitate Gunnar in bringing aboard more celebrities and industry execs. Violator Management head Chris Lighty, who manages the careers of such superstars as Busta Rhymes and Diddy, has signed on as an investor, and the company has already inked endorsement deals with chart-topping artists B.o.B. and Soulja Boy. Will 50’s investment garner as much dough as the Glacéau deal? That might depend on whether 3D TVs will go boom or bust. So far, it’s been the latter. But just wait until you see 50 hawking the shades on the red carpet for his next movie–you can bet it’ll be in 3D. Help us keep Fast Company free online: Fill out this short survey.